Some people were born with a silver spoon while others held their spoon still without shaking it,when they were just toddlers. 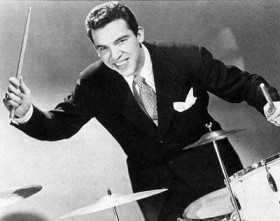 One such person is Buddy Rich, a musical genius..the drumming prodigy unlike anyone the world has ever seen before. Born at Brooklyn in 1917 to first generation Jewish-American parents, Buddy Rich started playing drums when he was less than 2 years old, gained a huge fan following when he was just a kid and became one of the highest paid child artists in the world between 1925 and 1930. In his late teens Buddy played with Artie Shaw,Bunny Berigan and Joe Marsala without much of an impact, virtually unnoticed by the American public.His success on the big stage would come three decades later in 1966. What would be called the performance of the life time,"West Side Story Medley", a complex medley with a tinge of Jazz and rhythm, earned Rich a critical reception amongst the critics for his exceptional, syncing drumming to the fast paced rhythms of the musical charts. Buddy Rich would also join hands with the famous drummer from India, Ustad Rakha to create the vintage album Rich à la Rakha which would be played in most of his live performances along with West Side Story Medley and Channel One Suite.